This group, called "Laxmi Saraswati SHG", consists of 11 ladies who live in a small village in the Nayagarh district of Odisha, India. 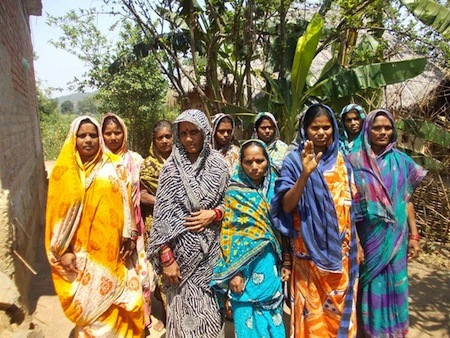 The group has applied for a loan of 275,000 INR from People's Forum (Kiva's partner). All the members of this group are involved in different livelihood activities like animal raising, vegetable selling, etc. Chabita, the lady standing with her hand raised, is a 34-year-old married mother. She has been working as a vendor, selling fish and other food. She started her business with a small amount of capital and would now like to increase her sales volume in order to increase her profit and raise her child well. She has requested a loan to purchase more fish and other food. Chabita hopes to expand her business to live comfortably with her family. She, along with her group members, is very excited and grateful to Kiva and its lenders across the world for this kind help and support. Congratulations to the Laxmi Saraswati SHG Group in India..! Learn more about Holographic Belief Replacement and get Powerful New Beliefs.